Mild & Delicious. 100% pure sweetener. Certified USDA Organic. 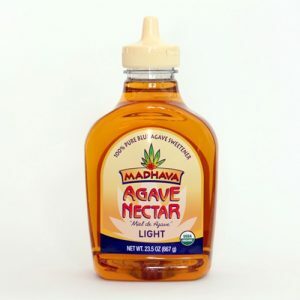 Madhava’s Agave Nectar has many fine qualities that make it ideal for all of your sweetening needs. Among them are its certified purity, consistent delicious mild flavor and a lengthy shelf life (won’t crystallize). And, importantly, agave nectar has a low glycemic index that is beneficial for many. Plus, it is so easy to use as it pours and dissolves quickly, even in cold food or drinks. But, best of all, it simply tastes great and enhances the flavors of any food it sweetens. Enjoy! Our organic Agave Nectar is made purely from the juice of the agave. There are no additives or preservatives.